Earlier in the week, we took NHL and JSL out bowling. 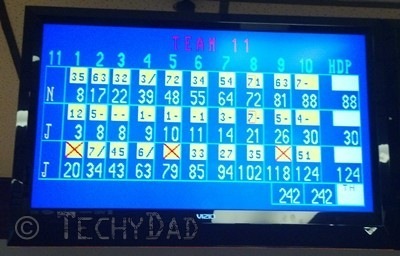 NHL tends to get very competitive while bowling and can get upset because I bowl better than he does. Then again, I DO have a few more years of practice. When, after the first few frames, he was in the lead, he began to exclaim about how he was beating me. I told him that it wasn’t nice to gloat about doing better than someone else because you never know when you will start doing worse. I was only a few pins behind him and I figured that he’d blow a frame or two or my bowling would pick back up to my usual levels and I’d go ahead of him again soon. I was so confident that I tweeted a lesson to be learned. 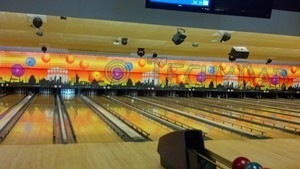 Then, in the eighth frame, with NHL only ahead by 3, all the pins went tumbling down on the first roll. Yes, there was a strike. Only I didn’t get it. NHL did. Suddenly, the pressure was on. My lesson about not gloating was at stake. I focused and got a strike as well. But then NHL did something amazing. Something I never expected him to be able to do. He got another strike on his next throw. That’s right, he got a double! I couldn’t replicate it and fell hopelessly behind. I wound up with 101 to NHL’s 119. I guess it was bound to happen sooner or later. 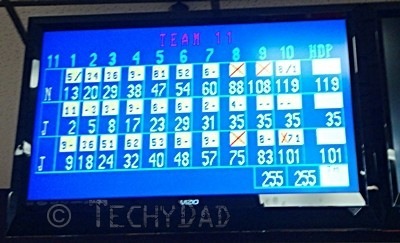 NHL surpassed me in bowling. I told him how proud I was of him. Not for beating me, mind you, but for getting such a great score, his personal best. The next game, NHL began by knocking 8 pins down. He was feeling good and looked primed for another gloating session until I got a strike on my first throw. And then a spare. And then a nine and a spare and a strike. He wound up with 88 to my 124. So I guess the lesson pulled through in the end. Don’t gloat because you never know when your luck will run out and someone will do better than you. I just didn’t expect it to apply to both NHL and myself.